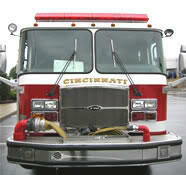 The Cincinnati Fire Department could learn this week if it will receive a federal grant to pay for a 40-member recruit class that starts in February. The city has been successful in getting these Staffing for Adequate Fire and Emergency (SAFER) grants. SAFER grants come from the Federal Emergency Management Agency, but fire chief Richard Braun says it gets harder each time. "We're at the very end," says Braun. "They have allotted all of the money so we haven't heard yet if we've received the next one or if we've been rejected... The next thing we hear will be a positive or a negative with that." The department is authorized to have 841 firefighters. Right now there are 831. That number could drop to 820 by the end of the fiscal year in June because of retirements. Some parents are complaining about people panhandling near schools in Cincinnati. Now city council could vote on an ordinance to ban the practice with fifty feet of a school or its premises. Council Member Christopher Smitherman, a father of five, made the proposal after hearing from other parents. "The worst thing that I would want to have is someone soliciting me while I am picking up my child. Period." Council member Yvette Simpson has some concerns with the proposal. "I have not personally experienced this issue around schools," she says. "But I'm always sensitive to issues that affect our children so I'll keep an open mind." The city has similar prohibitions against panhandling near ATMs, parking meters and outdoor dining establishments. The Law and Public Safety Committee could discuss the issue again in two weeks. The Law and Public Safety Committee is also recommending two spaces be renamed in honor of fallen first responders. The ordinance proposes renaming East Hyde Park Commons in honor of police officer Sonny Kim. The same motion would rename Queensgate Recreation Area in honor of fallen firefighters Daryl Gordon and Oscar Armstrong III.